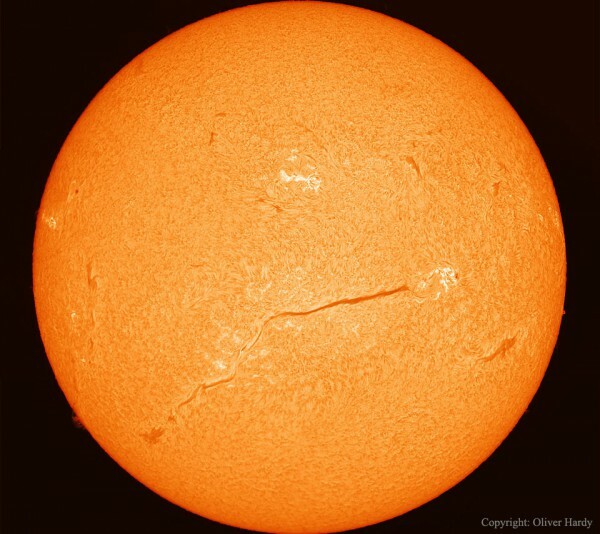 Yep is not directly to the sun very often, not least because you burn the retina, but on 9 February this year was a very nice and interesting phenomenon: an extra long size Solar filament. 700 thousand kilometers long, hot gas hyper linked to a curious magnetic field make some gas on exit and stop looking so curious. Color is due to hydrogen, when this magnetically excited and that temperature causes take that color. Curious. These filaments, eventually, or explode out or collapse. In this case, it collapsed.